The Sultanate of Naqala continues to flourish. 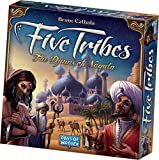 This time of prosperity has attracted more competitors than grains of sand in the desert, so if you expect to remain on top, you'll have to learn some new tricks... especially since the Sultan founded 5 new fabulous cities that everyone wants to control. I've also heard that the Sultan sometimes holds hearings in those cities, offering huge rewards to those who grant him his whims. Are you up for the challenge? 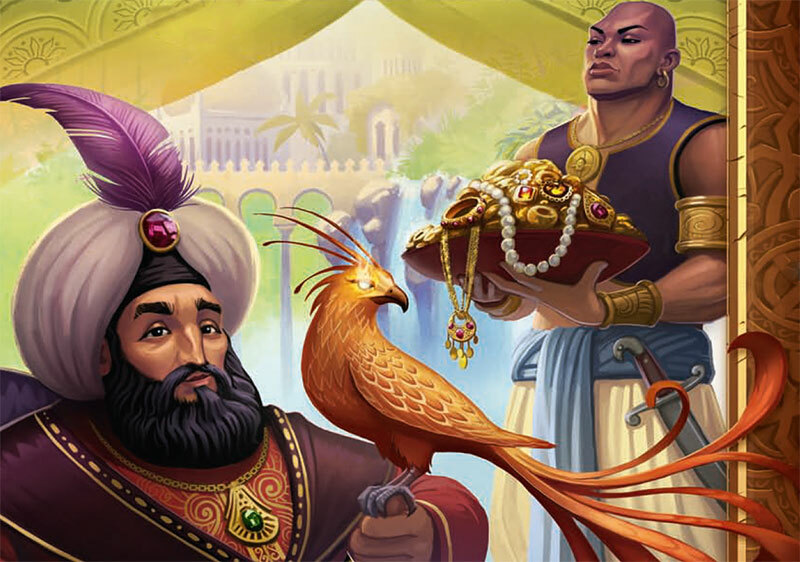 With "Whims of the Sultan", up to 5 players can now vie to control the 5 fabulous cities and work to satisfy the Sultan's requirements. 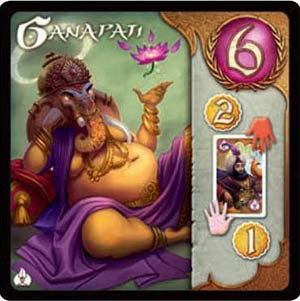 This expansion can be played with the base game alone or along with "The Artisans of Naqala" expansion. 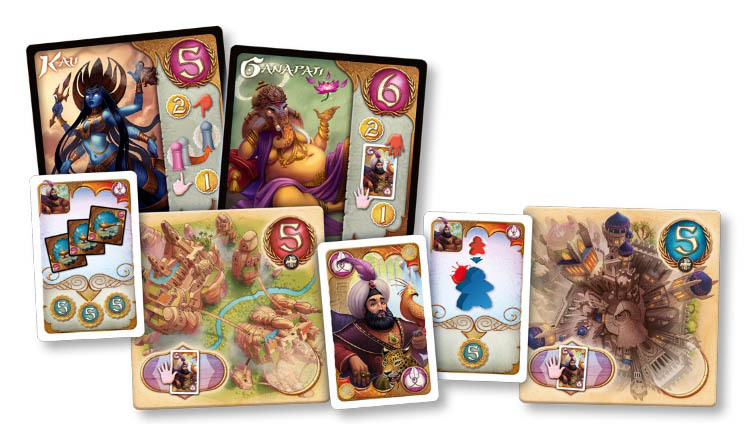 Note: This expansion provides the components needed to play 5-player games of Five Tribes. This option is only possible by adding at least one of the expansions that adds tiles to the game. The only change to the setup in this case is to switch the bid order track and the turn order track from the base game with the ones provided in this expansion. In a game with 3 to 5 players, each player gets 8 camels and 1 turn marker in their color. In a 2-player game, each player gets 11 camels and 2 turn markers in either pink or blue. 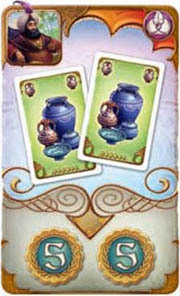 Bid order & turn order tracks, Resource cards, Djinn cards (don't forget the new ones! ), gold coins, palm trees, and palaces are placed according to the usual set-up. Take the players' turn markers and randomly place them on the bid order track. This will determine which order the players initially bid for position. Mix the 6 tiles from this expansion with the ones from the core game. Place them at random on the table, forming a 6 x6 tiles square (the board). Tip : The board will be easier to read if you use the same orientation for all tiles. Remove the 3 Whim of the Sultan cards that have the Artisans symbol from the game. Shufe the remaining Whim of the Sultan cards and place them face down as a draw pile close to the board. Draw the top 5 cards and put one face up on each fabulous city. Mix the meeples from the core game and from this expansion in the bag. Then grab and drop them in random sets of 3 on each tile EXCEPT FOR the Great Lake tile that remains empty. 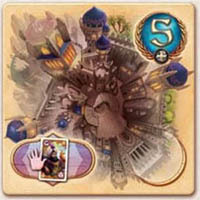 Mix the 6 tiles from the "Whims of the Sultan" expansion with the ones from the core game. Draw 14 tiles at random from this stack and add the 6 tiles from "the Artisans of Naqala". Shufe these 20 tiles together and place them at random on the table, forming a 4 x5 tiles grid. Lay the 22 remaining tiles around that grid so that you end up with a 6 x7 tiles grid (the board). Note: Because of the mountains, make sure you use the same orientation for all tiles. Also, if a tile is entirely surrounded by mountains or cut off from the rest of the board because of the Great Lake and/or the Chasm, restart the setup, as all tiles must remain accessible. Place the mountains on the designated spaces on the workshop tiles. Shufe all the Whim of the Sultan cards and put them face down as a draw pile close to the board. Draw the top 5 cards and put one face up on each fabulous city. 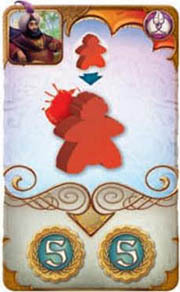 Mix the meeples from the core game and both expansions in the bag. 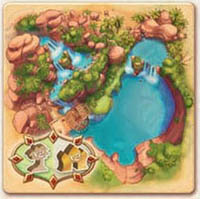 Then grab and drop them in random sets of 3 on each tile EXCEPT FOR the Great Lake and the Chasm that remain empty. Shufe the Item markers and stack them face down next to the board. Each player receives the tent in their color. This booklet explains how to play with the new game elements. Other rules remain unchanged. The Great Lake is a forbidden, impassable tile. There can never be any meeples on it, during setup or during gameplay. At the end of the game, EACH palace or palm tree on a tile adjacent to the Great Lake tile (either orthog- onally or diagonally) is worth twice the amount of points it would normally bring (10 for a palace, 6 for a palm tree). If you control all ve cities, you score 125 points So, make you sure you don't let a single player control all of them! Tile Action: When you end your move on a fabulous city, add the Whim of the Sultan card to your hand if there's one on the tile. If there is no card on the city, you get nothing. 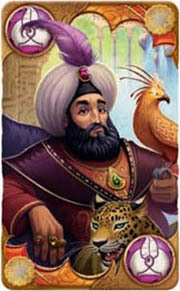 During the clean-up phase, add a new face up Whim of the Sultan card on the cities where there are none. Each card shows a special request from the sultan, who will cover you with gold if you meet his requirements. If you already meet its requirements, put the card face up in front of you and immediately gain the value of the gold coins pictured on the card. If you don't meet its requirements yet, keep the card in your hand. Later in the game, as soon as you fulll the conditions of the card, reveal it, place it face up in front of you and gain the value of the gold coins pictured. At the end of the game, cards that are still in players' hands are simply discarded. They are worth nothing but don't bring any penalty. All of the card effects are described on the summary sheet. Note: Only use the new tracks when playing 5-player games. 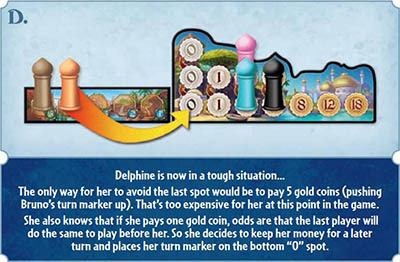 On the new turn order track, there are two spots worth 1, 3 and 5 gold coins. Bidding for those values works the same way as the "0" spot from the core game order track: the rst player who bids one of those values places their turn marker on the corresponding bottom spot. The second player to choose that value pushes the turn marker onto the top spot of the same value to make room for their own marker and takes the spot to play before the "chased" player. There are only two spots per value, which means that each of those values are limited to two players. Each time you push an opponent's turn marker on the turn order track, collect 1 gold coin. 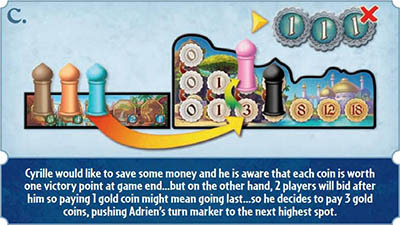 Each time your turn marker is pushed by an opponent on the turn order track, collect 2 gold coins. 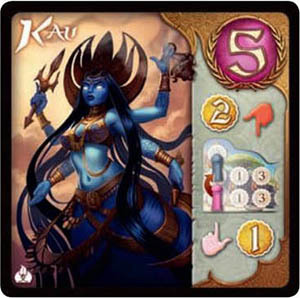 Note: Even though the card shows the 5-player track, Kali's power is active in all games. Collect one gold coin each time you get a Whim of the Sultan card, and 2 gold coins each time one of your opponents does.